It has been a long wait, and now as the show is over, I am exhauted! There were so many great moments tonight. 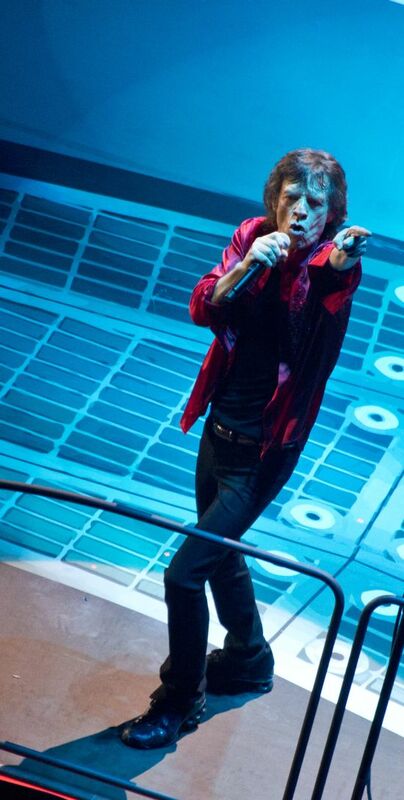 Like when Mick said from his heart, and not reading from any scripts, how much he thanked us, the fans, for coming back, listening to their music, and buying their records. For fifty years. 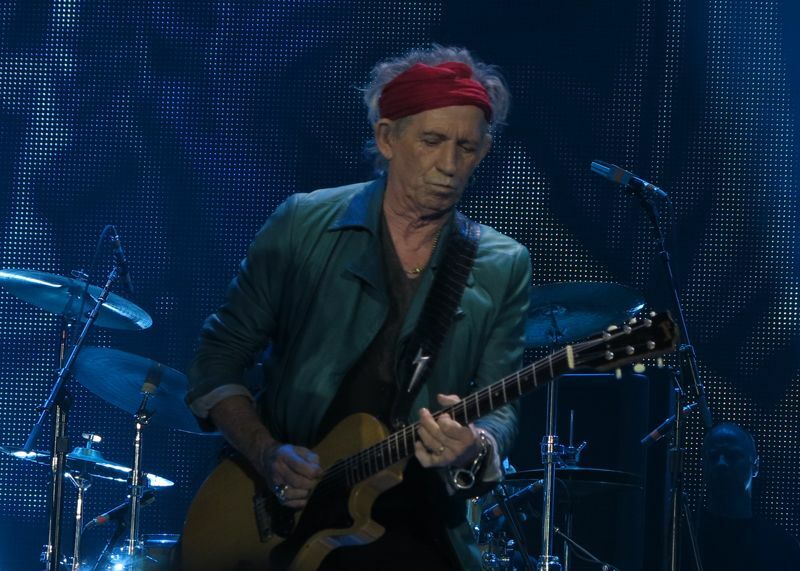 Or when Keith took the center stage to give us yet another great Sympathy For The Devil guitar lead, sort of made me forget all the other great guitar players that took stage tonight. Because after all Keith is next to nothing when he takes the lead on his guitar. No compromises. Or when Mick Taylor forgot about the Stones and started improvisations on "Midnight Rambler". Then he was good old guitar hero Mick Taylor. Or Bill, thankfully on two songs, and I could see his smile, he was happy! They gave us two and a half hours. I am not sure if I will sleep tonight. But the good news are I am so lucky I will see them again on Thursday in the same house! It all started at 8:27pm. They ran a video of fans talking about their feelings about the Stones. There was Elton John. And there was Johhny Depp. And there were us. The fans. I did recognize some familiar faces. The collage was done nicely, running quickly with bits from fans in Europe, USA and Japan, telling about their love for the band. It was a 5 minutes video, nice! And as you might know, we all helped in a bit in making this video. Real fans! Then it was on to some stomp sort of rhythms a la Sympathy For The Devil, heating up the beat and the crowd for what is soon to come. The drums are growing stronger and stronger and then, right around 8:35pm, they hit the same stage they left 5 years ago. "I Wanna Be Your Man". So fast. So good. Kick start! 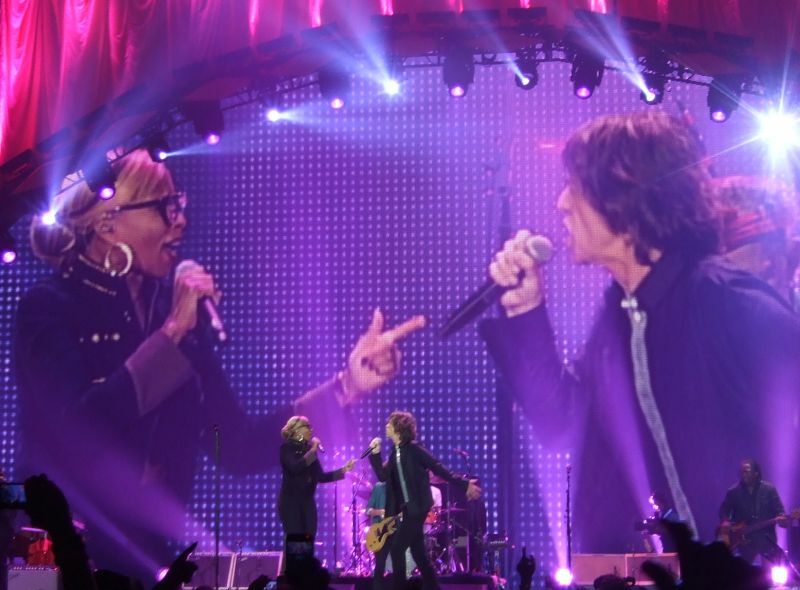 "Gimme Shelter" with Mary J Blige was perfect. Sorry Lisa, I have seen many guest artists but this one is probably one of the best. Please keep Mary J Blige in the set for all the shows! She wasn't shy at all. And she rocked! I think she was all over the stage, with Keith, With Ronnie, with Mick a lot, and her voice and interpretetion was so great for Gimme Shelter. I could have written all night, but I need some sleep.... I just wanted to mention the stage. Fantastic. No B-stage. No technicalities with moving band members or moving stages. 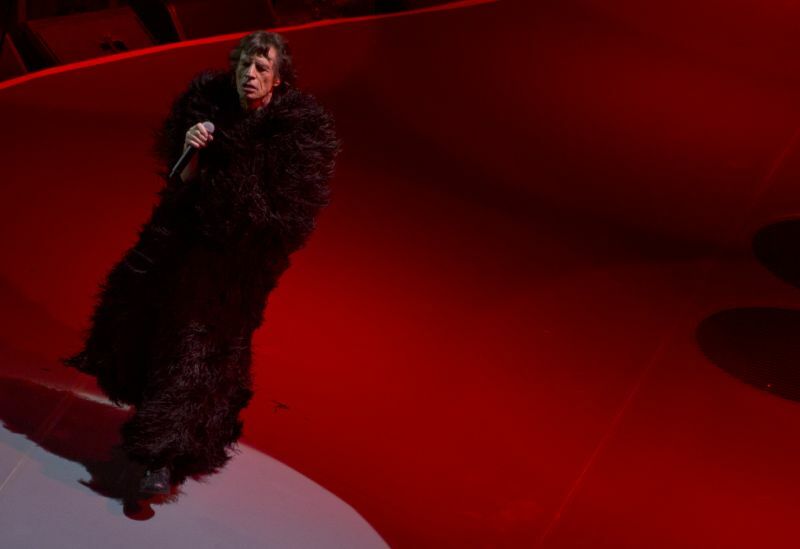 Mick had a monkey sort of coat for Sympathy For The Devil, it looked strange, and he got rid of it fast anyway. Wild Horses had some difficulties. It sort of lost the flow. Don't know why. They have done better versions. But who am I to complain, I just noticed it was not following the flow, may be it was me, or the sound. Did not bother me much. May be it was planned that way, or may be it was a bonus. I don't know. But when they started "Miss You", Mick had some problems with his headset. So he told Darryl to do a bass solo. 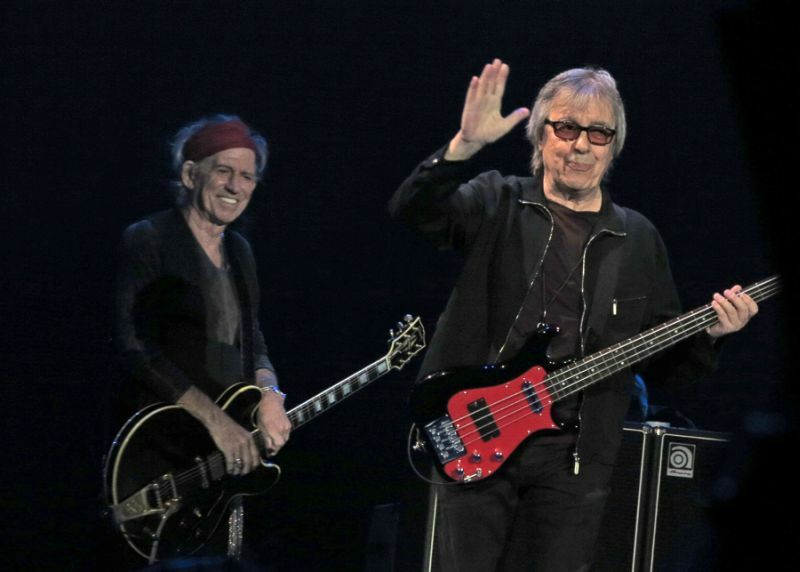 Keith and Ronnie was big smiles as Darryl played and played, how often do you get an extended bass solo with the Stones? The crew worked like crazy with Mick's headset and then he was back on a strong version of Miss You! Then the Choir on "You Can't Always Get What You Want" - in fact two Choirs, one on either side. They were great. Big big smiles on the all the young girls' faces, while the boys looked very serious for some reason. It will be three long days until I will se them again on Thursday. 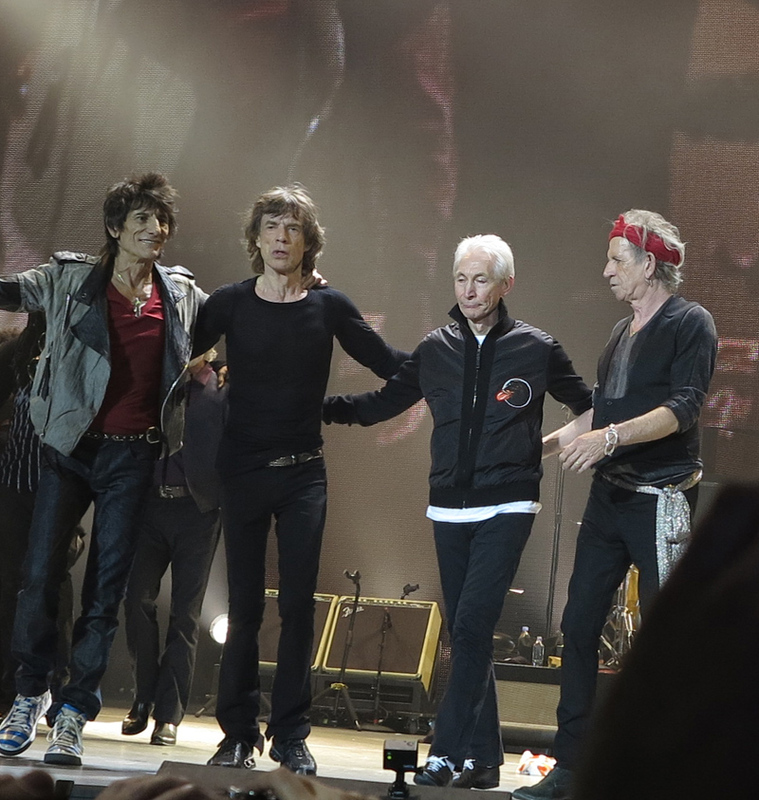 Thank you Mick, Keith, Charlie and Ronnie - and Bill and Mick T. Thank you for your music. You have been - and you are - a major part of my life! I took some pictures during the show. Security was great, nice, and allowed all our little cameras and mobile phones, so that we could bring our private little pictures back to our family, children and grandchildren, to show them what is still in fact the greatest rock'n'roll band on this planet! The above photos are by Bj�rnulf Vik. 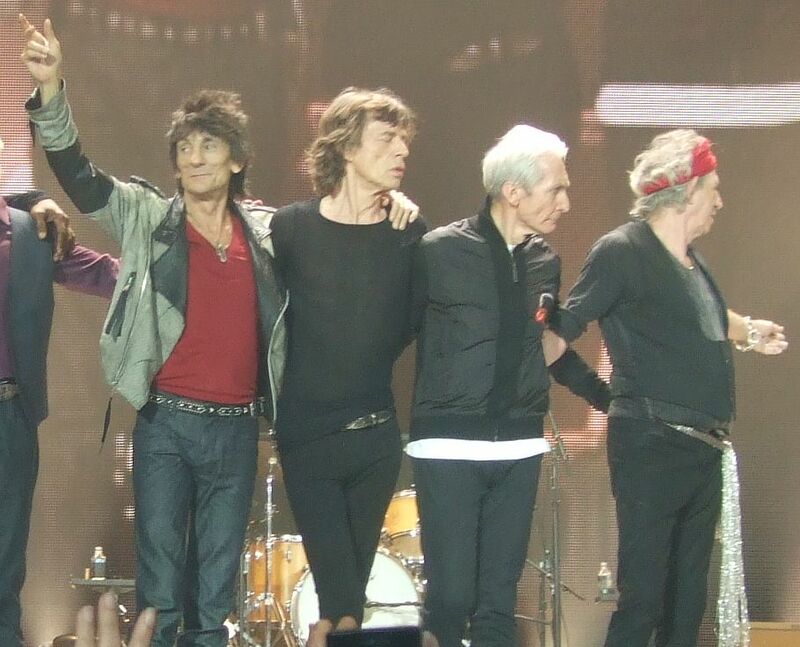 To state it quickly: The Rolling Stones were ON tonight. They were well prepared, they took the right amount of risks, they incorporated their guest stars well, and they did just about everything the loyal, or even casual, fan could expect for a 50th anniversary show. And most importantly, they expanded the boundaries of rock and roll by showing that a band with members at or close to 70 years old could put on a brilliant performance equal to (or better than) blues artists ( or Chuck Berry, bless him ) who never let their age get in the way of getting on stage and captivating an audience. I expected the opening number to be a signature hit song to get the crowd going, but instead it was a most thoughtful and respectful selection that spoke volumes about the band' s history, England's history, and the history of rock and roll: I Wanna Be Your Man, an early hit for the Stones, written by friendly rivals John Lennon and Paul McCartney. While it did not immediately fire the crowd up to a fever pitch, it set the tone for an evening that was musically adventurous. 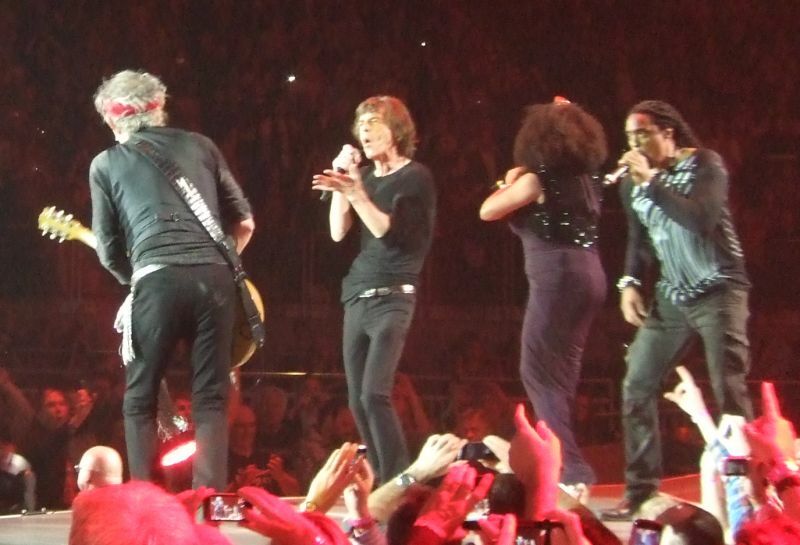 The first major surprise was Gimme Shelter, with Mary J. Blige joining the Stones for the female vocal part. While her participation was tentative at first, Mary delivered a fine performance which Mick seemed to enjoy. We could compare it to Merry Clayton's recorded version, or the adequate version Fergie of the Black Eyed Peas did with Mick in 2009 with U2 as the backing band, but the live standard in my mind is Lisa Fischer (on stage and doing back up vocals with Bernard Fowler tonight). While Ms. Blige had a powerful voice, star power, and was entertaining, the climactic sustained note left me wishing that Lisa was opposite Mick like on many tours before. 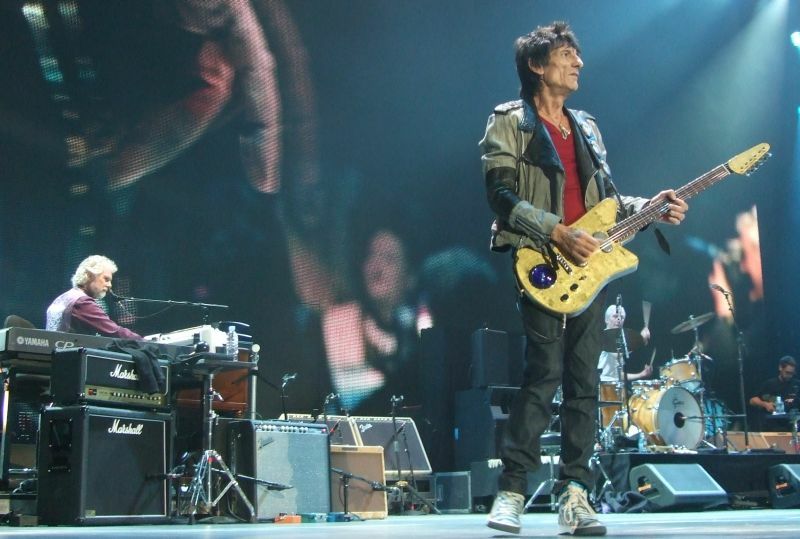 Jeff Beck' s recent work with Mick (on Saturday night live earlier this year) really paid off with an amazing version of Goin' Down, a blues song that Freddie King made famous and that Keith played at the Guitar Legends Expo in Spain in 1992. 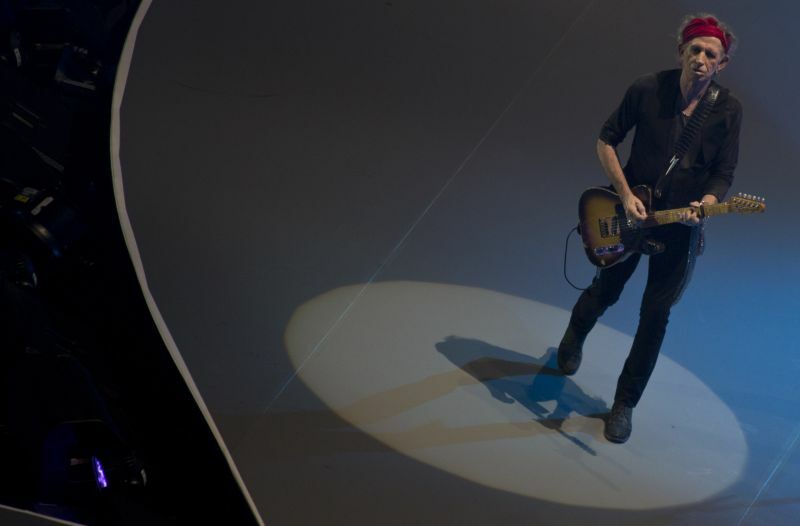 From the first notes he played, Beck was loud, assertive, and in perfect guitar legend mode. The song also allowed for great leads from Keith and Ron. Ron Wood seemed especially in synch with Beck, and it reminded me of the Truth album from 1968 that Jeff, Ron, and Rod Stewart made. I had not thought about that album for years, but a great show like this will send you home with work to do, revisiting and rediscovering recordings. The two new songs (One More Shot and Doom and Gloom) played back to back fit nicely into he set, and made clear that for all the history and retrospection, this is still a contemporary band. Keith's scowling back up vocals of I love I love I love ya on One More Shot made for a moment of clarity that yes it is 2012, and this band can still thrill with new material. Mick Taylor's guest spot on Midnight Rambler was a delight. I had seem him last May at the Iridium Club in New York, and he was subdued to say the least. But tonight he was so into it, stomping around with Mick, playing blistering leads, and simply showing a joy which I never had seen from him in any concert footage before. 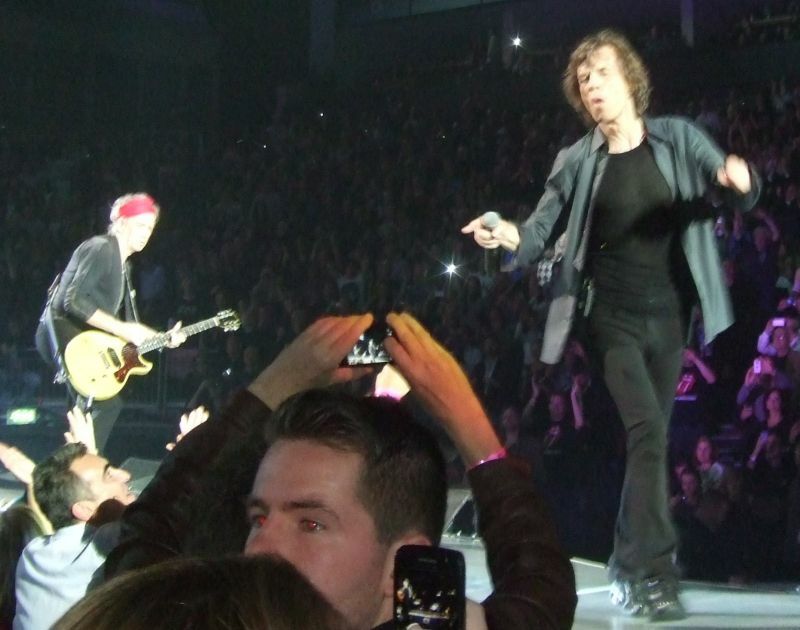 As nice as it was to have Bill Wyman and his elder statesman smugness on It's Only Rock and Roll and Honky Tonk Women, I think the OTHER Mick earned the title of best performance by a Rolling Stones alumnus. There was so much to this show, it would take another 20 paragraphs to cover. 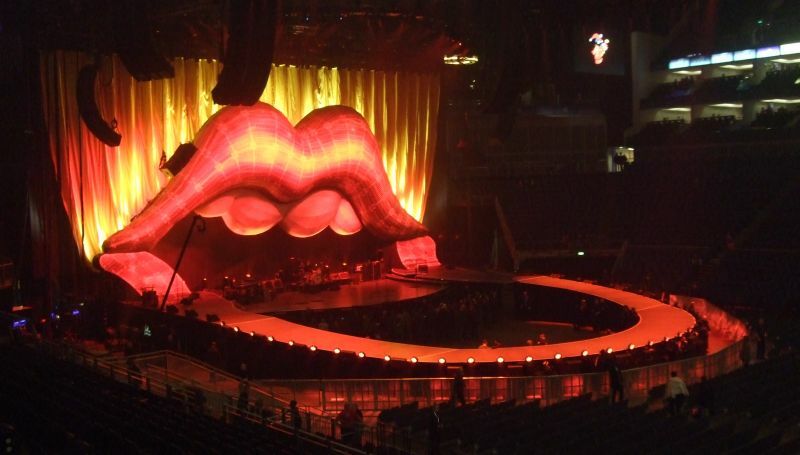 We will leave the discussion of expensive tickets, the fact that the Stones did not play Satisfaction, or the horrible public safety threat that post concert London rail transportation is for another day (sadly it will take deaths or violence to correct the insufficient number of trains after a show, a problem Wembley also had). There was a gentleman next to me who had traveled from Croatia for the show. Once the show was over, he shook my hand and said, "It is good to be back, isn't it?". Indeed! It was good to be back as a fan, great the band is back, and great to be reminded that no matter what life throws at me, the chance to once again see the last twenty seconds of Tumbling Dice live makes anything livable. Work the extra hours, put some possessions for sale on EBay, or make a trip to the pawn shop so you could make some show(s). 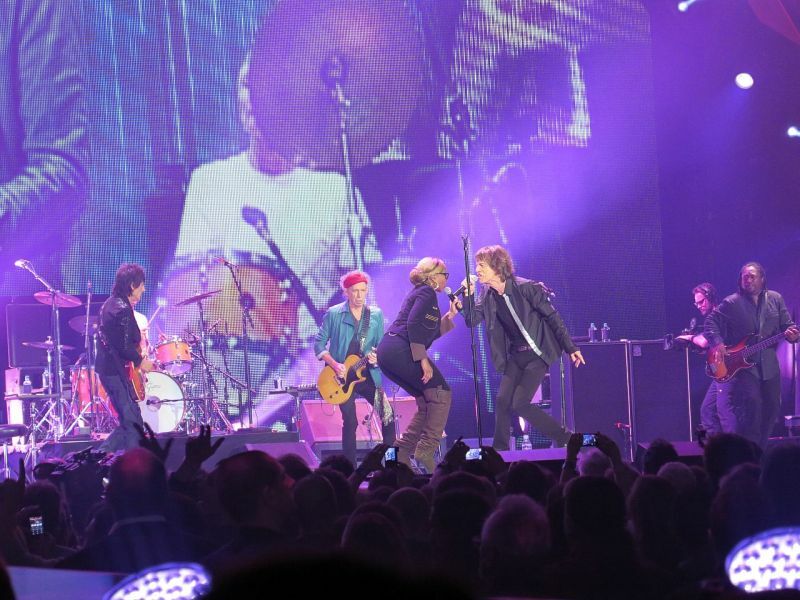 If you thought seeing the Stones was life affirming before, you will see it in 2012 more than ever. The above photos were taken from level 4 by Josef Massinger. - It was loud, too loud. 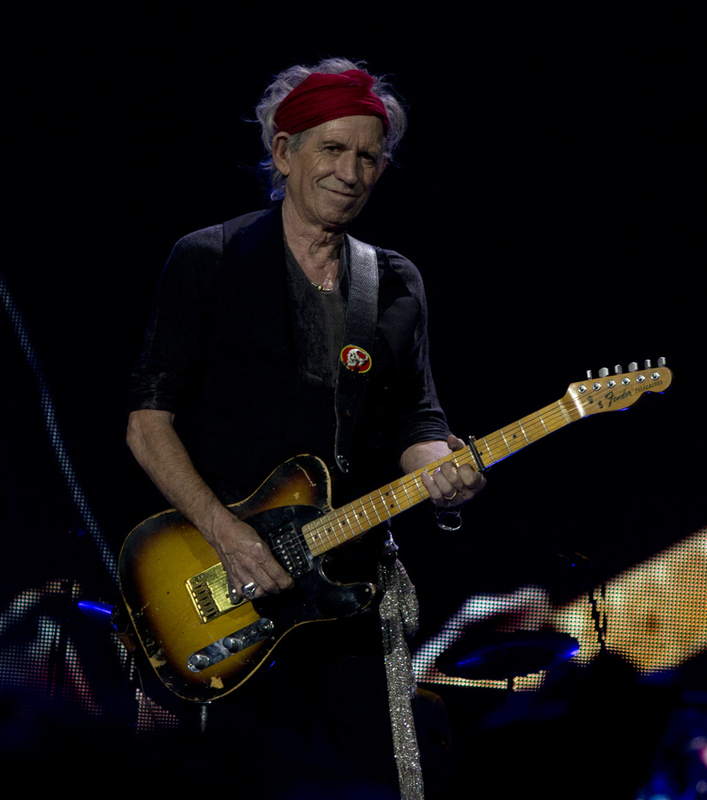 The Stones should not ruin what is left in the ears of their elderly fans. Would we not enjoy the show and the music more if it was only a little bit less loud? I was suffering mainly during the sections with Mary J. Blige and Jeff Beck. - I thought the Stones had a very strong start. I was deeply enjoying it. - After Jeff Beck the show somehow calmed down. So did the public. - Then at the end they, the Stones, the show, were coming again. The �You can�t always get�� was a great idea and something new. Well done!!! - Poor Lisa: she must have suffered when Mary J. Blige sang her part. 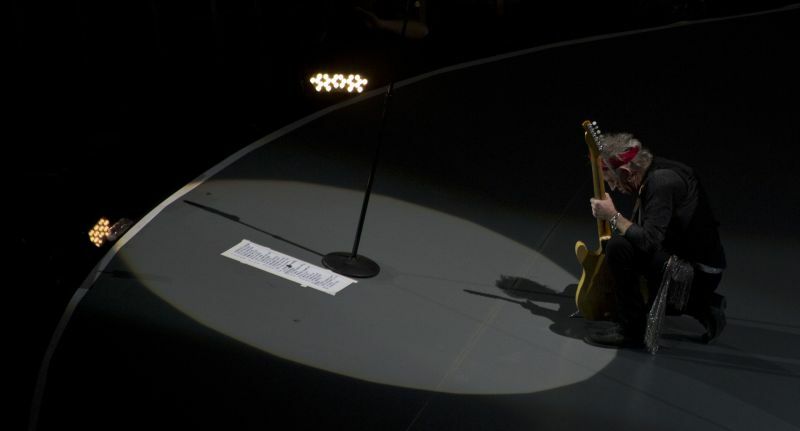 - I think it was not such a good idea to have Jeff Beck coming in while there were wonderful guitar players were on stage (like Keith and Ronnie). We came to see them and not others. This was my spontaneous feeling. Keith and Ronnie stood somehow in the back. - I had the feeling that Keith was more serious than in other shows. Did he suffer and not support all of that what was happening (high prices, Jeff Beck stepping in, Lisa a little bit put aside)? 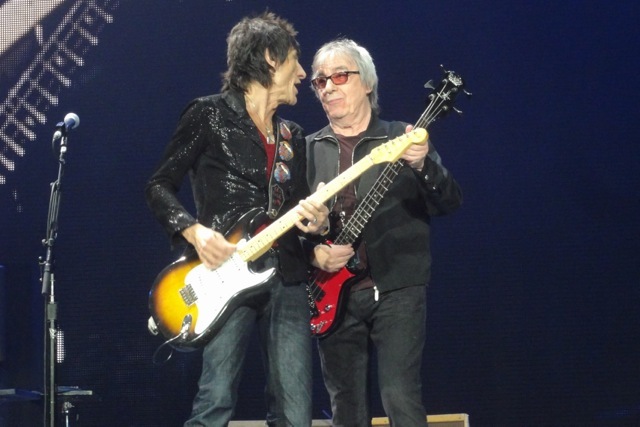 - I very much appreciated the showing up of Bill Wyman and Mick T. Well done and well justified. On another matter: the London transport system was a shame, closing down the train system at midnight leaving thousands of fans out in the cold night at O2. These are my subjective feelings and impressions of the show. I was glad I was there and I enjoyed it. It was a long day, flying in from Basel in the morning. But after settling in the hotel and taking a cable car (how Swiss) to the venue and the Pilot Inn, the fun really started. It was good to meet so many people with interesting stories over a few beers. But then it was time to head to the O2. There were already big crowds of people at the entrance. But we got rather quick in, had some food and looked inside at the great stage. 20.28 was show time! 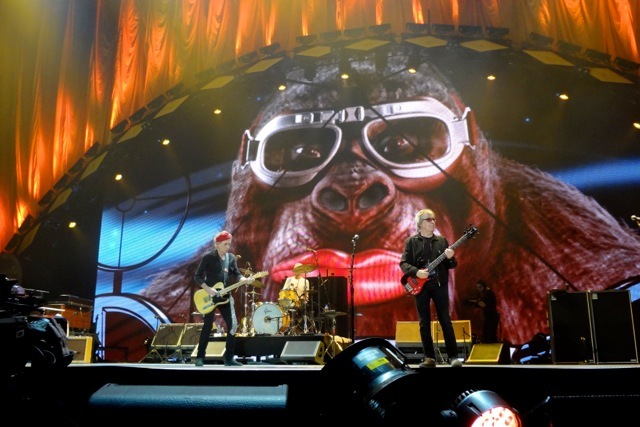 First a video with many known (Elton John, Johnny Depp, Iggy Pop) and unknown people giving their opinion on the Stones, including Bj�rnulf... Then some drum rythms mimicking the Sympathy intro and a whole lot of drummers with gorilla masks walking through the arena, a spectacular opening, followed by almost the beginning: a fast I Wanna Be Your Man. One of the best openings ever! And we got more oldies: Get Off Of My Cloud and It's All Over Now. The last with some old video footage, including Brian Jones. Next song was a great Paint It Black. It was clear that the band was on fire, all of them, Keith in particular. The guitars were loud and clear. Then it was time for the first guest: Mary J Blige on Gimme Shelter, she absolutely can sing, but for me this song works better with Lisa Fischer. She does this better (and she was there) in my opinion. Some great songs followed, like Wild Horses and All Down The Line; the latter with some nice video footage again of old blues, soul and rock icons. Then the second guest appearance: Jeff Beck, very loud on Going Down... Then there were the obvious 50 year remarks, referring to the Queen and James Bond jubilee as well. Then for me one of the highlights: a blistering hard and sharp Out Of Control. On the Babylon tour already a favourite and still a great song. After this song Mick announced that they would play the whole "Satanic" album, but luckily for us we got both new songs One More Shot and Doom And Gloom. Both very good songs. The above photos are by Michael Sold. �Counting their money�, some critics said. �Rocking their wheelchairs� somebody sneered. When the Stones (50 years and counting) burst out into I wanna be your man everybody in the audience (20.000) knew: this band is alive and kicking. The first five numbers of the show were tight as hell. 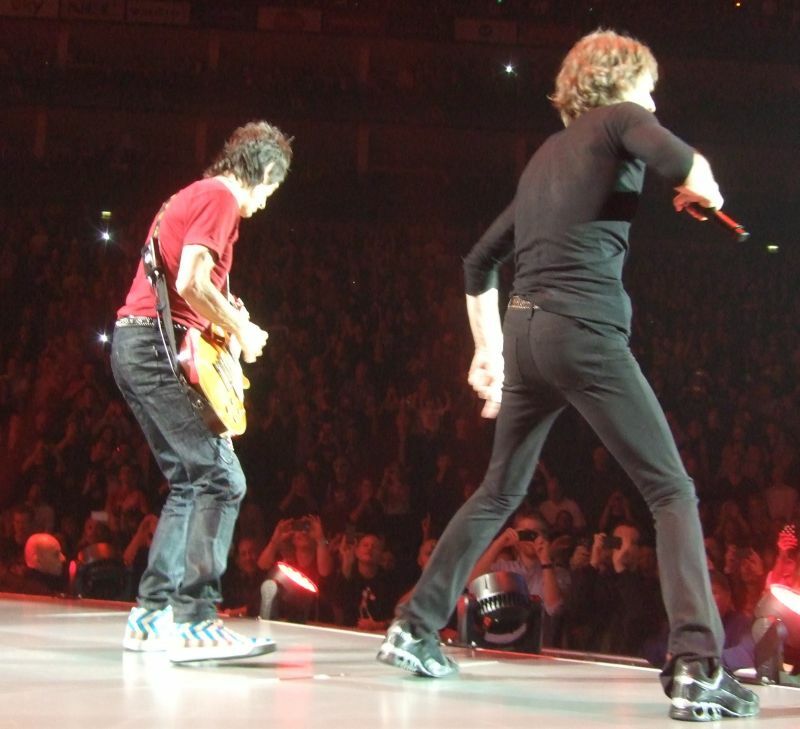 Mick was concentrated and when he realized everything was going well he started to loosen up. 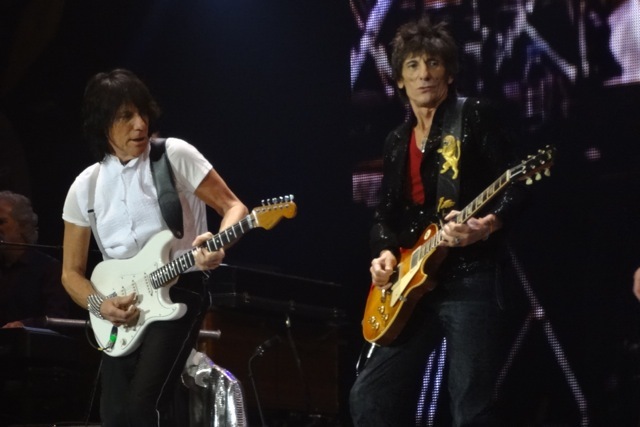 Ronnie was the man in charge (great solo�s on I wanna be your man and It�s all over now), while Keith was doing fine. He had his great moments f.e. during Sympathy for the devil. Charlie was steady as always, wearing headphones during Sympathy, not to be disturbed by the rhythm-box. 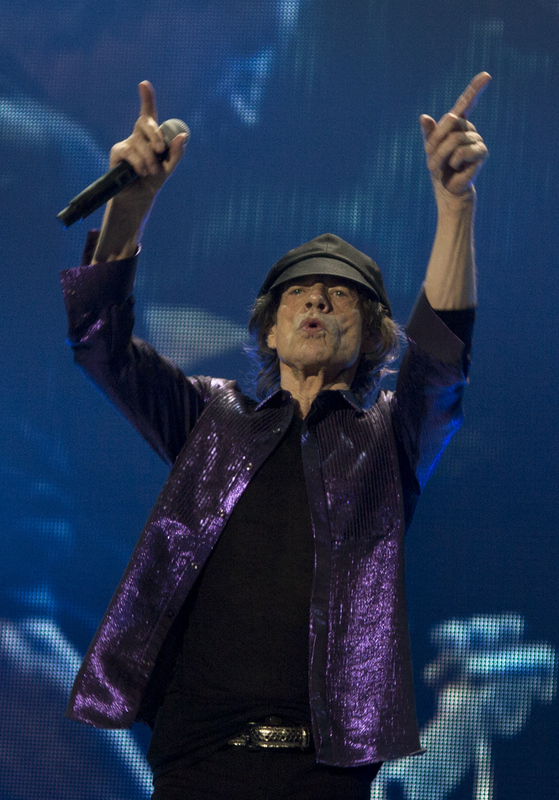 In the evening I noticed that fans of a certain age, climbing the stairs, showed a lot less energy then frontman Mick (1943) did on stage: working at 69 can still be fine. We were all tired and satisfied at the end of the show, only to learn later that two numbers (Lady Jane and Satisfaction) were skipped because of time-limits. At 23.00 hours the show, which started at 20.25 hours, should be over and it was. That this show was a true anniversary-show became clear when Bill Wyman (76) took the stage for It�s only rock�n�roll and Honky Tonk Women. It was amazing and emotional to see old Bill playing the bass. No overdubs by Keith this time! I liked Pain it black, Gimme Shelter (with Mary J. Blige), Wild Horses, Out of Control, All down the line and Midnight Rambler. 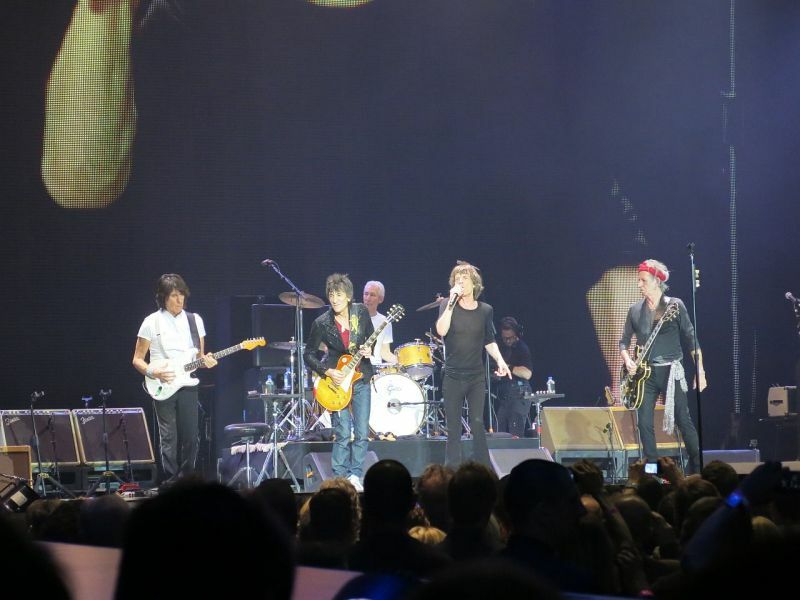 Mick Taylor joined the Stones performing on Midnight Rambler. At first he seemed to be searching for the right notes. Ronnie en Keith backed off as if to say �come on Mick this is your moment, grap it.� And Taylor did, fabulous! When Jeff Beck did his thing, earlier, during I�m Going Down he wanted to put his mark on this number so much that he - according to my taste � overdid it. Keith looked a bit embarrassed, not at ease. The new numbers One more shot and Doom and Gloom were played quite good, though Doom and Gloom didn�t had the same appeal as the studioversion. Keith did his two songs Before the make me run and Happy, not bad at all. The finale was very special when a choir entered the stage for You can�t always get what you want. 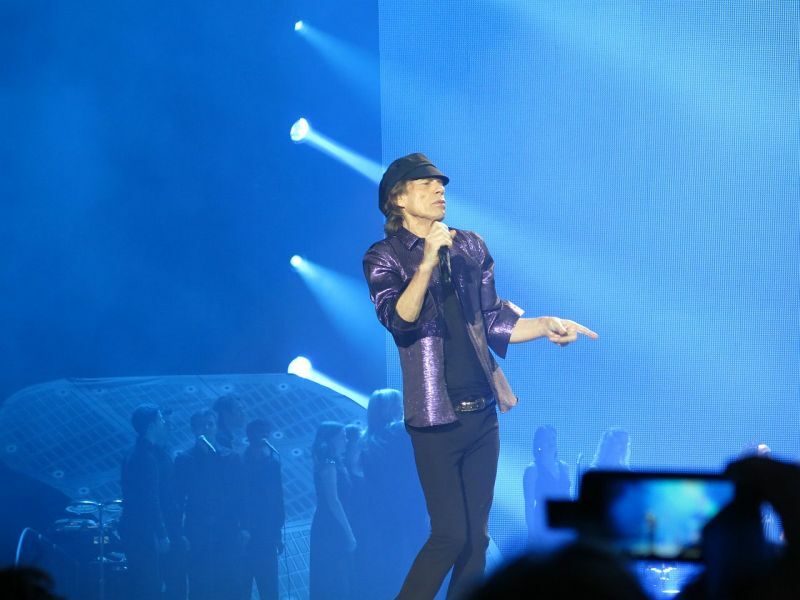 And when Mick asked to join in I sang this song with my friend Ronnie, and he said one word and that was� GREAT!!! The above photos are by Klaus Lauterbach.
' What a show! 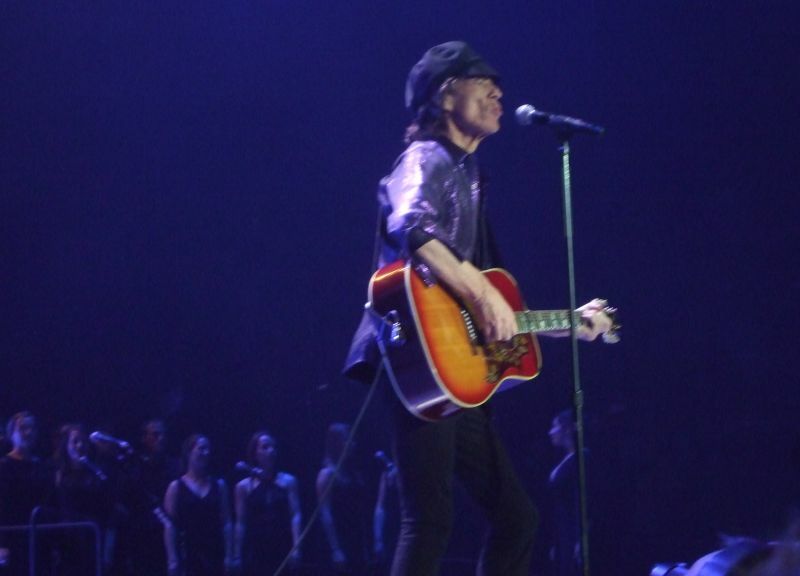 Mick was as agile as at any time in the last twenty years and, although Keith was a little subdued, it seems he was focusing more on his playing than on �throwing shapes� as was the case on the last couple of tours. Kicking off with �I Wanna Be Your Man� was an amusing way to start...but it won�t be so funny if they keep it in the set. Finishing with �You Cant Always Get What You Want� , with a choir, followed by JJ Flash, was a masterstroke. 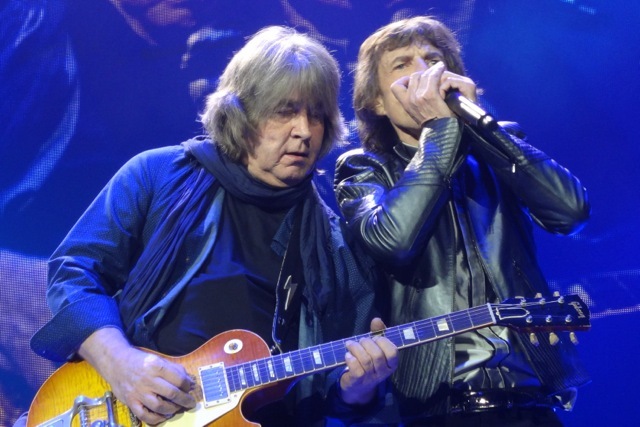 Mick Taylor proved that he can still be the most lyrical guitarist on the planet on �Midnight Rambler�, Beck was on fire on �I�m going Down�, and it was an unexpected treat to hear Ronnie and Keith trading power chords on �Out Of Control�. �Wild Horses� slowed things down too early, and �Before They Make Me Run� was as dreadful as always...but, hey, this was one of the greatest Stones gigs ever, so who�s complaining?